The MX 680 in-ear headphones from Sennheiser and adidas provide high-quality audio and durability in a compact and lightweight design. Ideal for the sports or workout enthusiast, the headphones have a sweatproof design for indoor or outdoor use at any time of year. The headphones have an exclusive EarFin design and soft earpads for a comfortable, stable fit that won't fall out. Box Dimensions (LxWxH) 5.8 x 5.6 x 1.9"
MX 680 Adidas Sports Earbud Headphones is rated 3.5 out of 5 by 24. Rated 2 out of 5 by Commonkore from Slightly over rated When I first got these headphones I was very impressed both by outward quality and excellent sound. Having now used them for several weeks I've become disappointed in performance. I use them exclusively on my iPod during my runs. An ongoing issue I have with headphones is that they never last long in terms of where they connect to the device. Already these headphones are demonstrating intermittent connection problems and they are only three weeks old. I find the sound quality to be excellent and the external volume control is very convenient but all of this pales when it has connection issues which I was hoping would not be the case but alas there it is. I will not be buying another for sure. Rated 3 out of 5 by Patrick from Great Sound, Cord is Short These have great sound, but the deal-killer for me was that the volume knob/clip on the cord was too short (I'm 6'2). When clipped to my waistband, the earbuds didn't quite reach my ears, and when clipped to my collar, the cord didn't reach my pocket. The volume knob/clip was also just a tad too heavy to leave hanging. If there were a few more inches in the cord, I would have loved these headphones. Doesn't shut out ambient noise, but that's not the point of these. Rated 4 out of 5 by Liz Likes Running from great for running These things rarely fall out and have great sound quality to keep you running. They've only turned off once when I was drenched in sweat. Other than that, great for water resistance. Very comfortable too. Good options for short or long cord extension. Only problems are the ear pieces fall off sometimes, especially when you carelessly throw the headphones in your purse and pull them out like I do. They usually last me about nine months until I've tugged on the wire too much and the sound gives out. Overall great quality for the value. Rated 3 out of 5 by Steve from Earfins are interesting... These are a pretty solid choice for workout headphones.I've always been a Sennheiser fan, so I picked up this pretty inexpensive pair of workout headphones to go with a new gym membership.The earfins are a little bit funny feeling at first (at least in my ears), but they do come off if you don't like them, and you can try the several sizes of rubber ear pads. I use the largest right now, which do a good job of keeping the buds in my ears, but sometimes create a seal in my ear canal that makes the sound off a little. The cable is a bit long for me, but that can be tucked away somewhere...Sound quality is pretty good for earbuds on par with the original Apple headphones; not too bad really. I'm not a big fan of in-ears headphones sometimes, especially when I'm on the go, so I opted for the buds.Next time around I'll try getting ones with ear hooks. Rated 4 out of 5 by Anonymous from Longer than comments claim I use this product while running and after fiddling around with different tips, I finally found the right fit. Although the headphone cable is short, another wire is given with volume control that makes it longer. The sound itself leaves something to be desired as after using Bose earphones, the base and the overall quality took a dive, although for the $$ I paid for them, it was a good deal, especially since they are water resistant. Rated 4 out of 5 by Anonymous from Works great, lightweight I got these for running, and they work very well. They are very lightweight. If the music isn't on, I can't even tell I'm wearing them. I thought I wouldn't like the ear fins, but I don't even notice them. They stay in my ears, and are definitely sweat-proof. The cord is two pieces - so if you are using an arm-band you can use just the short section. However, the volume control is part of the extra section, so if you want to use that, you always have to have the extra section attached. But they sound great, and for the money, these have been the best sports earphones I have used. Note that these allow background noise in by design. If you want noise cancellation, these are not for you (but I can tell you from personal experience that you want you able to hear the fast moving cyclist behind you yell out, ON YOUR LEFT! as you are making a left turn). Rated 1 out of 5 by Anonymous from Poor sound quality When I unpacked these headphones they looked nice, but that is maybe it. After trying first song, the sound was very very poor. 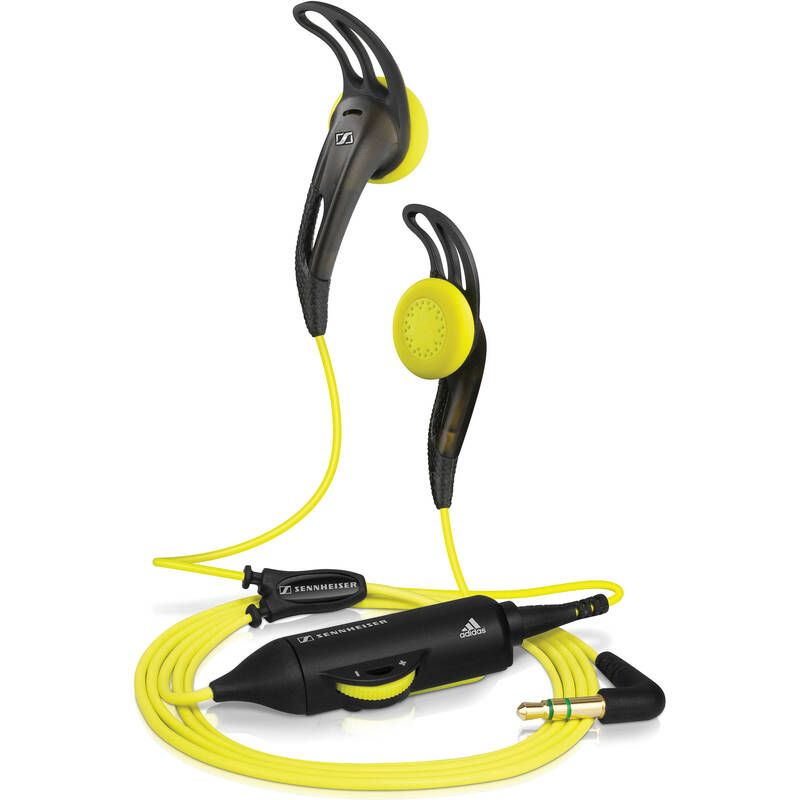 Maybe they are promoted as good running headphones but sound is on low level, no bass, metal sound coming out of them. I canon recommend them. I am still looking for some headphones for running or I use just klsch what I have now. Rated 4 out of 5 by Anonymous from Well thought out, but.... I like the product. Good quality, good sound, and nice design. Comes in a nice pouch that fits my small mp3 and headphones. I love the quality construction and volume control. The only problem is the little ear fins can come off and I have to re-attach them at times. I would recommend this product and am glad I purchased it.